OpenType is a modern font format that provides designers typefaces that can include extended capabilities and comprehensive character sets. Ranging from the functional to purely stylistic, OpenType features can help bring your Web typography to the next level. The first step in using OpenType features is to find the right font—not all fonts we offer through our service are available with OpenType features, so you’ll want to filter your results when searching for those to use in your projects. While on the “Web Fonts” tab from any search results, click on the plus icon next to the search field and select “OpenType Support.” The secondary menu to the right will also allow you to refine your results further based upon the specific character sets that can be paired with that font’s OpenType features. Once you have found an OpenType feature-enabled font you’d like to use, you’ll need to add it to your project. If you’re logged into your account you can add fonts to your project through the “Web Font” button and tab through search results, font family pages or product pages. An important reminder: When adding your font, to your project, under “Choose Language Support” make sure that you choose a character set that features “ + OT Features” in its name. 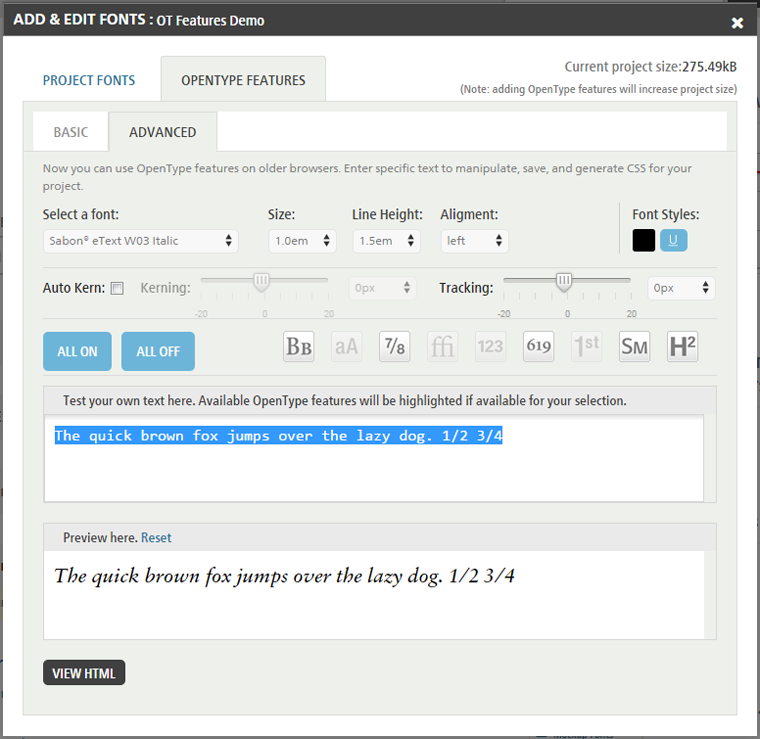 Once you’ve added the font to your project, it’s time to head over to the Manage Web Fonts page. 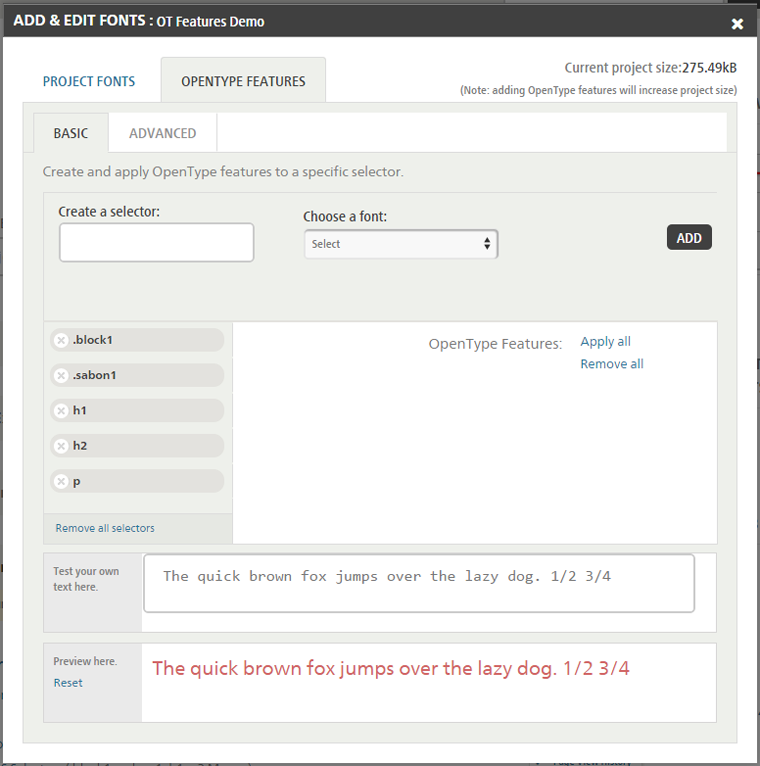 Expand the project that you have added your OpenType featured fonts to, and click the the “Add & Edit Fonts” link. From the window that appears click the “OpenType Features” tab. 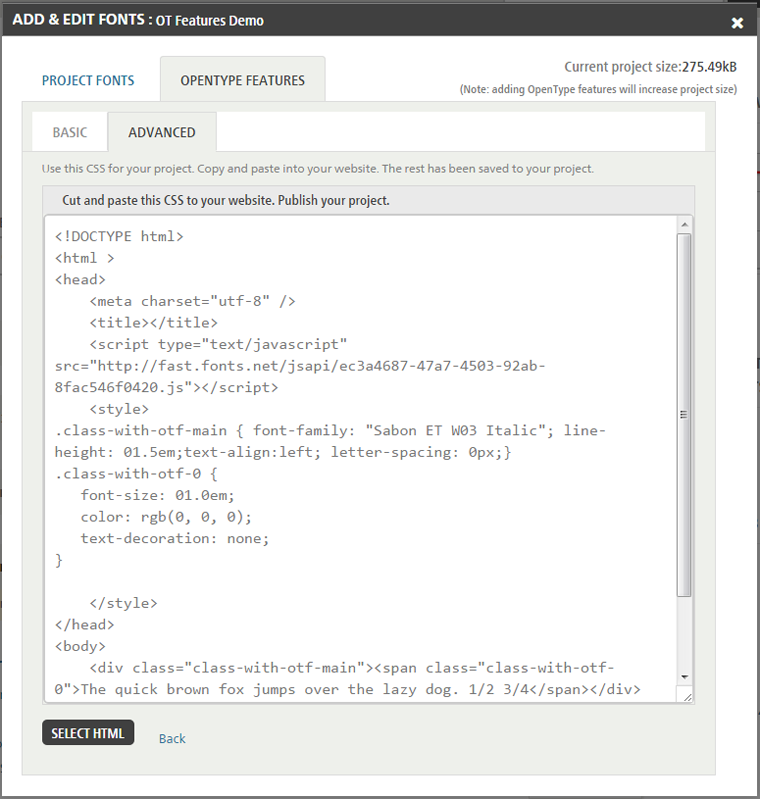 This will be your command center for working with OpenType features in your project. The first step in working with the “OpenType Features” tab is to create selectors for your project. A selector is a component of code that identifies a certain element or area on your page, which you can then assign specific fonts to. Some basic selectors you may have seen before include h1, h2, p, and b. First, in the “Create a selector” field, give your selector a name. Then from the “Choose a font” drop down menu, select the specific font weight or style you want to assign to that selector. Click “Add” and you’ll see your selector appear in the lefthand column of the window. Clicking the icon of any OpenType feature will then apply it to your selector. To get a feel how each OpenType feature will affect your font, use the text box below to enter sample text. You can mix and match options until you find the all features you’d like to include. Choose as many or few as you’d like—your project’s file size won’t increase. Here you can also choose to apply OpenType features to specific words, letters, or letter pairs, giving you the ability to fine tune the look of your text. OpenType feature icons will be highlighted if they are available for the text you’ve selected—just click the icons you want to activate the corresponding features. Once you’ve experimented and are satisfied with how your text looks, click the “View HTML” button to display the custom code snippet for your site. Just add it to your site to achieve the custom OpenType features you’ve created.